This beautiful "In Kindness & Sympathy" Cheese & Snack basket is a wonderful way to let them know you are thinking about them during their difficult time. Filled with irresistible flavored cheeses, savory crackers and snacks, plus delicious condiments to bring it all together, this basket features Roasted Garlic Flavored Cheese Spread, Brie Flavored Cheese Spread and other cheeses, Garden Herb Crackers, Gourmet Mustard, Mediterranean Olives, Portlock Smoked Salmon Pate, Cranberry Harvest Medley, East Shore Specialty Dipping Pretzels, and more! Also includes a Curved Cheese Knife Spreader and a Wooden Curved Cheese Board. 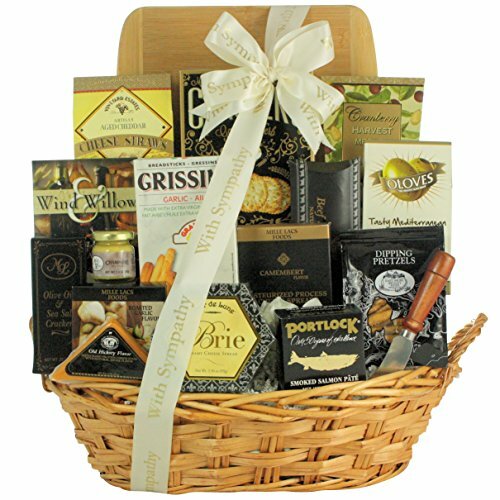 It is hand tied with custom imprinted "With Sympathy" ribbon and arranged beautifully in an Oval Stained Willow Gift Basket. This beautiful "In Kindness & Sympathy" Cheese & Snack basket is a wonderful way to let them know you are thinking about them during their difficult time. Filled with irresistible flavored cheeses, savory crackers and snacks, this basket features Roasted Garlic Flavored Cheese Spread, Garden Herb Crackers, Portlock Smoked Salmon Pate and more! Also includes a Curved Cheese Knife Spreader and a Wooden Curved Cheese Board. It is hand tied and custom imprinted "With Sympathy" ribbon.